The Aggies started the game off leading the Miners 3-0 in the first inning after a three-run home run by junior infielder Fiana Finau, who continues to lead the Aggies with 10 home runs on the season. UTEP answered with a run in the third inning but lacked the offensive drive to score anything else ending the inning with a score of 3-1. Kaitlin Ryder stepped into the box with one out and homered over the left-field fence to start a fourth inning rally for the Miners. UTEP saw another home run and a double to right to score a runner as they took a 4-3 lead with two outs. Freshman pitcher Dallas McBride came in to relieve junior Karysta Donisthorpe in the circle after Donisthorpe allowed four runs before exiting the game. The Miners added another run in the fifth to take a 5-3 lead heading to the bottom of the fifth. The Aggies could not score for three-straight innings until the fifth when they were able to reduce the two-run lead back down to one, as errors and walks plagued the UTEP circle. In the middle of the sixth inning, UTEP led the Aggies 6-4, which was the last time the Miners would lead for the remainder of the game. The Aggies took back control of the game bringing in an eight-run rally with two outs. Freshman infielder Rachel Rodriguez and sophomore infielder Haley Nakamura began the rally after scoring off of a single by Finau. Senior outfielder Malena Padilla followed suit, belting a grand slam over the right-field fence to give the Aggies a 10-6 lead over the Miners. The inning continued as Haley Nakamura singled to left field bringing Tatum Reedy and Kelsey Dodd across the plate to end the inning with a 12-6 score. McBride was able to hold the Miners off in the top of the seventh allowing no hits in three batters faced. The Aggies improved to 23-9 on the season while UTEP fell to 8-23. McBride was credited with the win pitching 3.1 innings for the Aggies while allowing only four hits in 14 batters faced. McBride advances to a 6-5 season record. Losing pitcher, Kaitlin Fifield fell to 4-9 as she pitched 5.2 innings before Danielle Pearson came in to relieve her in the bottom of the sixth. As a team, the Aggies total 51 home runs on the season with 234 RBI. 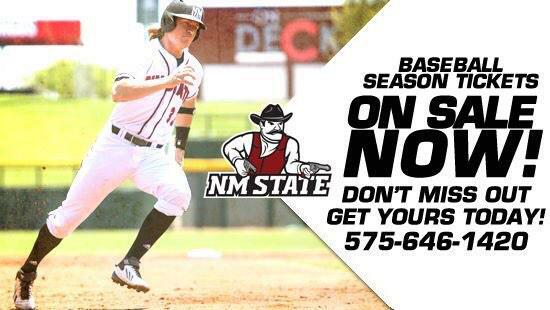 They are sitting at a .353 batting average with the Aggie pitching staff holding opponents to a .282 average. The Aggies face the No. 17 Arizona on Saturday in a doubleheader at the NM State Softball Complex in Las Cruces, N.M. scheduled to begin at noon.